Horses are a big part of the Griffith Park landscape. You can take your kids for a pony ride, go on a guided trail ride or ride on your own. Griffith Park is an enormous park in Los Angeles, with 6.5 square miles of urban wilderness and lots of trails to explore it on. 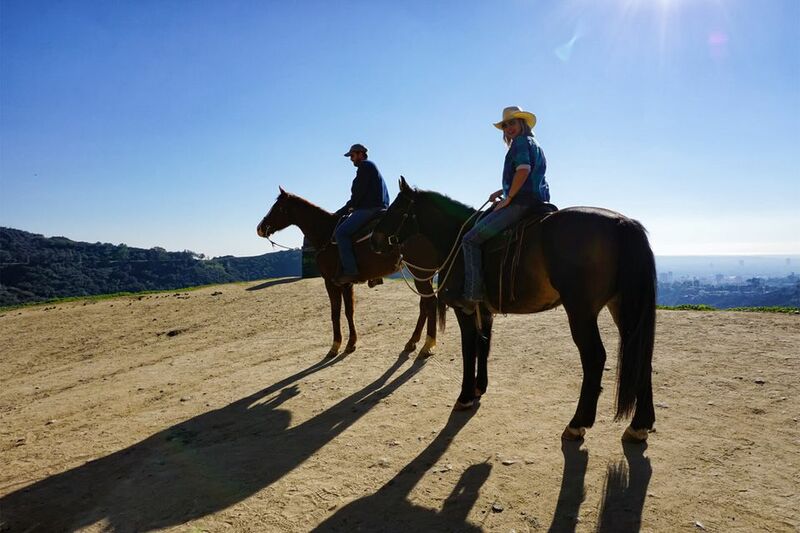 Adults will find plenty of specially marked trails, fire and patrol roads in Griffith Park for horseback riding and it's a great way to feel like you got outta town without going very far. Two privately-owned stables are inside the park, and a few more are close enough that they can take you riding in the park. Generations of Los Angeles kids have grown up enjoying the Griffith Park Pony Ride, with horses suitable for children up to 13 years old (or weighing 100 pounds or less). The price is less than the cost of some premium coffee drinks. They're open daily except for Mondays and holidays at 4400 Crystal Springs Drive. If you like to watch horses as well as riding them, the Los Angeles Equestrian Center hosts horse shows and the annual Tournament of Roses EquestFest, which showcases the riders who will be in the parade. If you are going riding for the first time, be prepared for a "horsey" smell when you arrive. Most companies have weight limits for riders, and they may weigh you before letting you ride. Some of them will accommodate heavier riders, but they may charge extra if you are above their weight limit. If you weigh more than 200 pounds, call ahead to discuss your options. You will have to wear a helmet to ride. It's the law. Bring some sanitizing wipes, so you can clean it before you put it on. You can also expect your muscles to be sore afterward, even after a short ride. Sunset Ranch Hollywood is located near the Hollywood Sign on the west side of the park. Their location allows them to do a unique trail ride through Beachwood Canyon with Hollywood sign and city views from the top of Mount Hollywood. They offer day and evening rides and riding lessons and have been running sunset dinner rides for more than half a century. Griffith Park Horse Rental at the Los Angeles Equestrian Center at 480 W. Riverside Drive offers trail rides every day and special sunset rides on Fridays and Saturdays that include dinner at a Mexican restaurant. Riders must be at least 6 years old and 4 feet tall, but the little ones can go on a hand-held ride while their parents walk alongside. Diamond Bar Stables offers guided trail rides, dinner and night rides. They're at 1850 Riverside Drive in Glendale. Rocken P Stables are also in Griffith Park. No reservations are required for their basic trail rides; you can just show up (with cash, the only form of payment they will accept). They offer a daytime Hollywood Sign ride, dinner rides, and two-hour sunset rides through Griffith Park at twilight, by reservation and with a minimum of three people required. Their address is 1850 Riverside Drive in Glendale.